In this paper, the development of fire-resistant geopolymers for the passive fire protection of buildings is investigated. The fire-resistant geopolymeric materials were based on the alkali activation of a metallurgical slag produced in primary copper industry with a highly alkaline solution of potassium hydroxide. In order to decrease the density of the developed geopolymers, their foaming or the addition of lightweight aggregates was also studied. The physical, mechanical and thermal properties of the developed materials were determined and their performance upon exposure to fire was tested according to the ISO-834 standard time–temperature curve, which is considered as appropriate for testing fire protection systems employed in buildings. During the whole test of the materials performance against fire, the temperature at the interface between concrete and geopolymer was recorded below 180 °C, as required by the ISO test followed, proving effectiveness for the developed materials to be used as a thermal barrier in buildings and constructions. After testing, the geopolymers kept their structural integrity, without presenting any significant macroscopic damage. 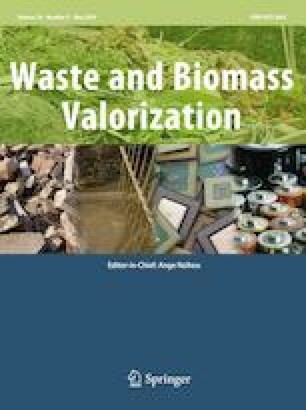 This specific research was undertaken, in order to face an industrial and social problem, which is the valorization of a metallurgical slag (copper slag) generated in enormous quantities yearly, through an alternative and efficient solution. The proposed solution concerns the development of novel and functional building materials, which will not only offer a massive utilization of slag, but also will protect the buildings against fire, offering to the society safety and security. The proposed solution takes the advantages of the geopolymerization technology and the developed geopolymeric materials have all the potential to be introduced into the market, since they can be compared to marketable fire protection materials. The valorization of one more metallurgical slag in the development of passive fire protection geopolymeric materials, gives the motive that the proposed methodology can work for most of the metallurgical residues, all over the world. A number of serious fires in buildings have been reported worldwide causing human life losses and injuries, as well as heavy structural damages of buildings and especially, of the concrete lining. Fires happened in buildings can seriously damage their concrete structure, thus threatening their stability and rendering them prone to collapse. Concrete damages are related to spalling phenomenon caused particularly by the spontaneous great amount of heat release and aggressive gases generated in a fire. Spalling is described as the breaking of layers or pieces of concrete from the surface of a structural element, when it is exposed to the high and rapidly rising temperatures experienced in fire. Spalling phenomena in concrete, which are related to fire, are expected at several temperatures, depending on the strength and the densification of the concrete. According to Hertz , explosive spalling has been observed at temperatures between 300 °C and 450 °C. However, it is generally accepted that concrete loses its carrying capacity when exposed at temperatures higher than 380 °C Sakkas et al. . This temperature is near to the calcium hydroxide dehydration temperature (400 °C), which represents a main phase of concrete, causing thus significant reduction of the concrete mechanical strength . The latter is considered to be significantly reduced at temperatures higher than 300 °C Sakkas et al. .
where T is the temperature in °C and t is the time in seconds. The average temperature of the unexposed side of the specimen not to exceed the initial mean temperature by 155 °C. Considering an average initial temperature of 25 °C, the average temperature at the interface between concrete slab and the fire protection material should not exceed 180 °C. The second criterion relates to the integrity of the fire protection material at the end of the test. More precisely, any cracks appearing on the surface of the specimen exposed to fire: (i) shall not be more than or equal of 6 mm thick, for a crack length of 150 mm or more; (ii) shall not have opening (at the point/locally) greater than 25 mm, which is maintained throughout the thickness of the specimen. The present research aims at developing fire resistant geopolymers for the passive fire protection of buildings, utilizing a metallurgical slag/by-product generated in primary copper production industry. It concerns for novel materials that combine unique thermal and fire resistance properties with an environmental friendly character. Fire resistant geopolymers have been developed since 1970, when J. Davidovits carried out researches for new heat resistant materials as an aftermath of catastrophic fires in France . Until today, a lot of fire resistant geopolymers, composite geopolymers and geopolymeric cements have been developed and studied. Rickard et al. developed a foamed metakaolin based geopolymer, which was subjected to the ISO–834 fire curve. Also  investigated the thermal properties of alkali activated materials made from ladle slag, exposing samples at temperatures up to 1000 °C. Temuujin et al. investigated the thermal properties of fire resistant geopolymer-type coatings, which were based on metakaolin and applied to steel substrates. Geopolymers are synthetic aluminosilicate materials formed by the alkali activation of solid aluminosilicate raw materials, according to the geopolymerization technology . The geopolymerization reaction is exothermic and takes place at temperatures below 100 °C and atmospheric pressure [5, 23]. Τhis reaction results in the formation of compact amorphous to semi-crystalline solid materials characterized by a specific three-dimensional polymeric structure. Therefore, geopolymers belong to the family of inorganic polymers, which are macromolecules linked by covalent bonds and having a –Si–O–M–O– backbone, where M denotes principally Al or Si and secondarily other metals, such as Fe [4, 5]. Geopolymers possess excellent physicochemical, thermal and mechanical properties, like low density, micro- or nano- porosity, high mechanical strength, notable surface hardness, thermal stability, fire and chemical resistance [2, 5, 12, 15, 23]. Particularly, the mechanical and thermal properties of geopolymers make them often viewed as alternative construction materials. Due to the excellent properties of geopolymers and given the large variety of solid aluminosilicate raw materials existing, the geopolymerization technology has gained increased scientific interest during the last decades. The most important potential raw materials for the production of geopolymers are the rich in silicon and aluminium oxides (especially amorphous) industrial minerals, such as kaoline, feldspars, perlite, etc. [3, 25, 27] and industrial by-products, such as fired-coal fly ash, red mud, metallurgical slags, etc. [2, 8, 12, 16, 21, 24, 26]. Specifically, the latter class of potential raw materials is extremely attractive, because of both their low cost and environmental reasons. In this paper, a metallurgical slag generated in primary copper industry was selected as raw material for the developed geopolymers. As it is well known, extractive metallurgy is strongly related to the generation of enormous quantities of solid wastes that cause severe contamination of the air, soil and surface and ground-water bodies. The copper slag utilized in this research is generated during the pyrometallurgical treatment of copper sulfide concentrates. The geopolymers produced from this slag demonstrated high performance in fire testing and similar properties with the commercial materials, comprising thus interesting materials for the passive fire protection of buildings. The copper slag (CS) used in the present study was provided by Boliden industry, which produces copper and other metals such as zinc, lead, nickel, gold and silver. For the preparation of geopolymers, an adequate quantity of granulated slag was grinded to a particle size − 180 μm. According to the chemical analysis of CS given in Table 1, it concerns for a siliceous material rich in iron oxides, with low amounts of alumina and calcium oxide. As is shown in Fig. 1, CS is an XRD amorphous material, presenting a broad hump in the region 2θ between 20 and 40° that is related with amorphous aluminosilicate phases . Given that there is no any crystalline phase detected in the XRD spectrum of CS, it is suggested that this material is at least 95% amorphous, rendering a perfect material for geopolymerization. An alkaline potassium hydroxide solution, 8 M KOH, prepared by dissolving pellets of anhydrous potassium hydroxide (Merck, 99.5% purity) in deionized water, was used as activator for the geoplymerization of slag. The reduction of the geopolymers density was studied with the following two processes: (a) addition of lightweight aggregates and especially of exfoliated vermiculite in the geopolymeric paste formed after mixing the slag with the activatorand (b) addition into the geopolymeric paste of aluminium powder, which generates hydrogen gas, acting thus as a foaming agent. Vermiculite is a clay mineral which exfoliates when heated sufficiently, resulting in a lightweight material with density lower than 90 kg/m3. Exfoliated vermiculite has numerous commercial applications, among which as high temperature or refractory insulating material, acoustic insulating material, cementitious fireproofing product, packing material and constitute of high temperature or oxidation resistant coatings. Metallic aluminium powder is commonly used and is very reactive in alkaline environments, whereit reacts according to the following Eq. (2), generating hydrogen gas. The geopolymers were prepared by the mechanical mixing of CS with the KOH solution to form a homogeneous and viscous paste. Potassium was selected instead of sodium as the alkali of the activator, given that the potassium based geopolymers have larger potential for developing fire resistant materials, due to the formation of crystalline phases with high liquidus temperature . The quantities of slag and KOH solution were selected so as to produce a geopolymeric paste with solid to liquid ratio equal to 6 g/mL, achieving homogeneity and at the same time smooth foaming, in case that the foaming agent (Al powder) was used. After mixing the geopolymeric paste for 5 min, the lightweight aggregates (vermiculite) or the foaming agent (Al powder) was added and slightly mixed with the paste. Then, the paste was molded in open plastic molds of the appropriate dimensions to prepare the specimens required for materials characterization and testing. The molded specimens were cured at 70 °C for 48 h. After curing, the specimens were de-molded and stored at temperature 20 ± 2 °C and relative humidity (RH) 50 ± 10%, until testing. The geopolymers prepared with the addition of Al powder will be named from now on “GeoAl” and those prepared with vermiculite, will be named “GeoVer”. The synthesis conditions of both materials are summarized in Table 2. The chemical analysis of the CS sample was performed by X-Ray Fluorescence (XRF) method, using a SPECTRO Xepos instrument. Mineralogical analysis of the same sample was performed according to the X-Ray Diffraction (XRD) method, using a Bruker D8 Focus X-Ray diffractometer (CuKα radiation, λ = 1.5418 Å, 40 kV and 30 mA). The uniaxial compressive strength of the developed materials was measured, using a servo-hydraulic loading machine. For this measurement, three cubic specimens of 50 mm edge were used for each material and the mean value of the three measurements was reported as the compressive strength of the material. The testing procedures of ASTM C109 standards were employed for the specimens dimensions, testing configuration, loading rate and calculations. The same cubic specimens were also used to determine the materials density through their volume and mass measurements. The thermal properties of geopolymers were assessed through their thermal conductivity, which was measured according to EN 12667:2001, using a Netsch Heat Flow Meter—HFM 446 and 15 × 15 × 2 cm specimens. The performance of geopolymers under thermal loading was assessed by subjecting them to passive fire protection testing. To facilitate these experiments, a custom made test furnace designed and constructed according to the EFNARC guidelines  was used. 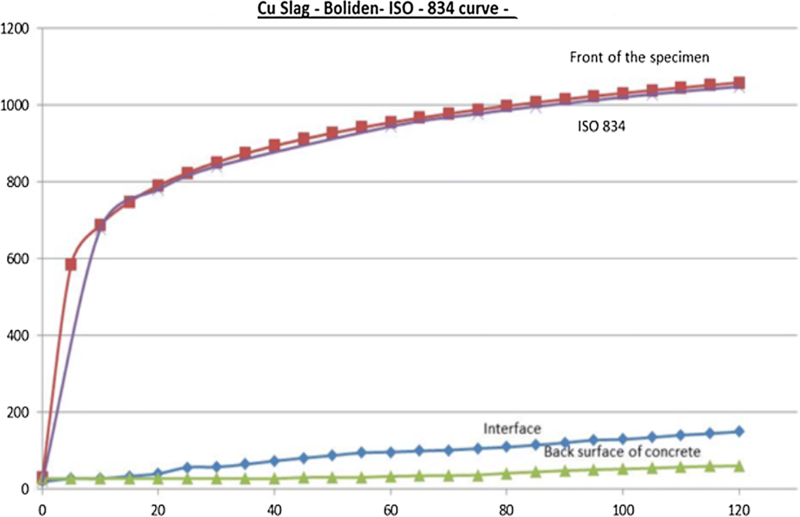 The furnace has the ability to simulate all the time–temperature curves, including the ISO-834 fire load curve . For each fire protection test, a composite cubic specimen 15 × 15 × 15 cm was prepared, consisting of two parts: a 10 cm thick concrete slab with surface area 15 × 15 cm, on which the geopolymeric material, having the same surface and 3 cm thick, was anchored. Concrete mix design used for the preparation of the concrete slabs also followed the EFNARC guidelines. Table 3 gives the mix details of concrete used for the slabs, as well as the compressive and flexural strength of concrete, 28 days after the production of slabs. The geopolymers were anchored on the concrete slabs with specific anhors (Fischer FNA/32), which were proved to be resistant under the most severe fire scenario of RWS temperature–time curve that reaches 1350 °C [19, 20]. The fire protection testing of geopolymers was performed 28 days after the used specimens production. During each test, the geopolymer surface opposite to that laid the concrete slab was exposed to a heat flux simulating the ISO-834 fire load curve. The temperature at the geopolymer/concrete interface was measured by using a K-type thermocouple, while the temperature of the unexposed concrete surface was measured at regular intervals with a high performance infrared thermometer. In Fig. 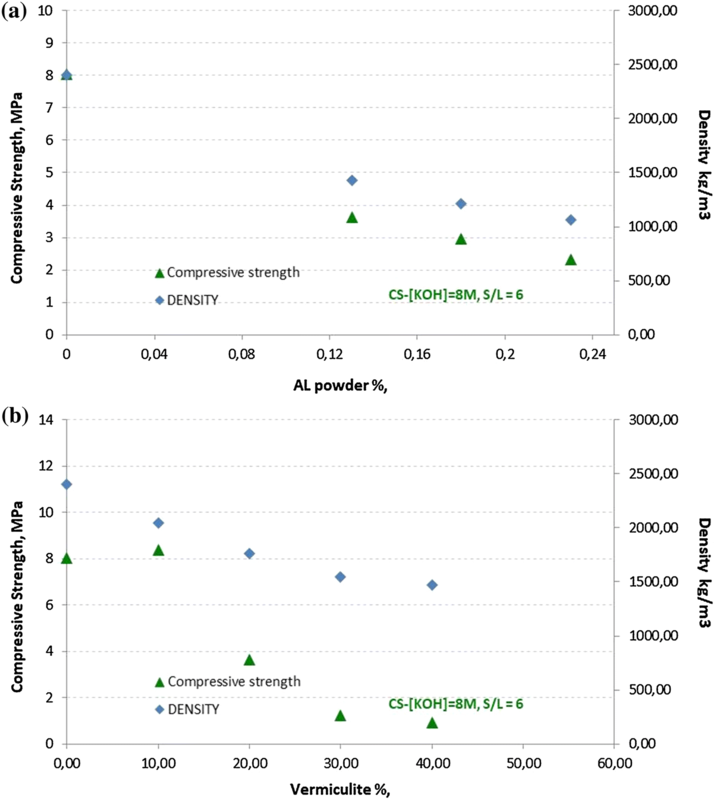 2, the compressive strength and density of geopolymers are presented as a function of the Al powder (Fig. 2a) and vermiculite (Fig. 2b) added for their production. As seen in Fig. 2a, the addition Al powder decreased the compressive strength of the geopolymer prepared without any additive. Specifically, the compressive strength of this geopolymer was decreased from 8.06 MPa to 2.33 MPa with the increase of Al powder. This decrease was attributed to the porosity generated due to the foaming of geopolymer, which broke the coherence of the compact geopolymeric mass, affecting negatively the mechanical strength of GeoAl materials. In the case of vermiculite addition, the compressive strength increased slightly with 10% wt addition and decreased for further addition (Fig. 2b), reaching a plateau at about 1 MPa, for vermiculite content higher that 30% wt. This low compressive strength of GeoVer materials is attributed to the incomplete bonding of vermiculite insoluble particles into the geopolymeric structure formed during the geopolymerization process. As the amount of vermiculite added into the geopolymeric paste was increased, the gel phase developed leading to the three-dimensional polymeric structure has been considered insufficient to bond the insoluble vermiculite particles, creating structural discontinuities where materials failed. According to the results given in Fig. 2b, the bonding of vermiculite particles into the geopolymeric structure seems to be successful, only in the case of 10% wt addition. However and taking into account that geopolymers developed in this research are designed to be applied superficially, there is no specific requirement for compressive strength. In general, the compressive strength of the commercial fire resistant materials used in similar applications varies between 1 and 6 MPa (Table 4). According to Fig. 2a, the density of GeoAl materials reached a lower value of 1066 kg/m3, which is similar to that of the commercially available materials (800–1400 kg/m3), while the density of GeoVer materials (Fig. 2b) seems to reach a pleateau at about 1500 kg/m3, after 30% wt addition of vermiculite. The low density of the GeoAl materials is attributed to the voids that were formed, due to the foaming process. The decrease of the GeoVer materials density is attributed to the very low density of vermiculite (80 kg/m3), which was added. However, the addition of vermiculite in the geopolymeric mass was not an endless process; additions higher than 40% wt made difficult the mixing of the geopolymeric paste and thus, impossible the production of geoplymeric materials, due to the insufficient bonding of such large volume of the aggregates in the geoplymeric structures. Considering the external view of the prepared geopolymers, GeoVer specimens had very smooth surfaces and appeared to be compact, while GeoAl materials had an open surface porosity with irregular pore size. It should be also noted that the measurements performed to determine the density of GeoVer materials were similar for the three specimens used, while the density measurements of the GeoAl specimens deviated at about 5%. The thermal conductivity of the developed materials with the lowest density, the GeoAl with 0.23% wt Al powder and the GeoVer with 40% wt vermiculite, was measured at 300 K equal to 0.14 and 0.11 W/m.K, respectively. These values are substantially lower than the thermal conductivity of some commonly used building materials, such as concrete blocks (0.5–0.6 W/m.K) and cement or gypsum plasters (0.2–0.8 W/m.K), as well as lower than the thermal conductivity of all the marketable fire resistant materials given in Table 4. This property is very crucial for the performance of fire resistant materials, because it determines their ability to operate as efficient heat flux barriers. Thermal conductivity influences the rate of heat transfer into the structural member and thus, it is most crucial for the performance of fire resistant materials. In general, for a given heat flux, the lowest the thermal conductivity, the highest the established temperature gradient across the fire resistant material. Further, for given heat flux and temperature drop inside the fire resistant material, the lowest the thermal conductivity, the lowest the required thickness of the required superficial coating. Therefore, the geopolymers developed in this work seem, from the thermal conductivity point of view, to have an advantage over existing cementitious fire resistant materials. Figures 3 and 4 present the experimental results from the fire testing of GeoAl and GeoVer materials, respectively, under the ISO-834 standard time–temperature curve. In particular, Figs. 3 and 4 shows the temperature developed with time at the interface between concrete and geopolymer and on the concrete surface opposite to this interface (unexposed concrete side), during the 2 h exposure in fire of the concrete specimen coated with GeoAl and GeoVer, respectively. 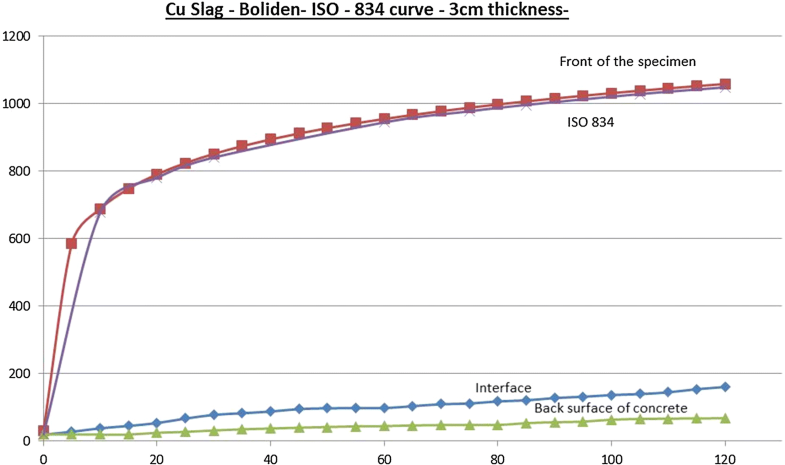 Moreover, the temperature of the furnace during the test, as well as the temperature on which the materials should be exposed with time, according to the ISO-834 test, are given in Figs. 3 and 4. The geopolymeric materials selected for the fire resistance testing were the ones with the lowest density, the GeoAl-0.23 and the GeoVer-40. As it is observed in Fig. 3, the temperature at the GeoAl-0.23/concrete interface was lower than 180 °C during the whole test duration, as requires the ISO-834 curve. Actually, after 120 min exposure in fire, the temperature at the interface between the two materials was 120 °C. Thus, the 30 mm thick GeoAl-0.23 coating achieved to retain the temperature at the interface at least 60 °C lower than the EFNARC performance requirements for an efficient fire resistant material in a passive fire protection test under the ISO-834 temperature–time curve. According to the experimental results shown in Fig. 3, during the first 10 min of testing, when the furnace temperature was increased from the ambient temperature to 600 °C, the interface temperature remained at 30 °C, establishing a temperature gradient equal to 19 °C/mm across the GeoAl fire resistant material. Then, the temperature at the interface started increasing, reaching a plateau at 100 °C after about 45 min from the testing start. At this time, the furnace temperature was 950 °C and the temperature gradient across the GeoAl material was 28.3 °C/mm. The temperature plateau formed at 100 °C is attributed to the removal of endothermic water through an evaporation process, consuming large amount of the incoming heat due to the large latent heat of water vaporization . After 120 min of testing (end of the test), the furnace temperature and the temperature at the interface of concrete and GeoAl reached their highest values of 1049 °C and 120 °C, respectively, establishing also the highest temperature gradient (31 °C/mm) occurred during the entire test. The temperature at the unexposed side of the concrete slab did not exceed 50 °C during the whole test duration, which means that the temperature across the concrete slab varied in-between 50 and 120 °C that is substantially lower than the temperature, where concrete undergoes spalling phenomena. The excellent behaviour of GeoAl material during the fire resistance testing was confirmed from the mineralogical analysis performed in different areas of the specimen tested (Fig. 5). More specifically, the XRD - spectrum of the GeoAl material at the interface with the concrete has almost similar mineralogy with the GeoAl material before any testing or treatment. As seen in Fig. 5, only slight mineralogical transformations, mainly related to zeolites formation (at 2θ about 5°–7°), have taken place at the surface of GeoAl laid on the interface with concrete. At the GeoAl side exposed to fire, the material has been recrystallized, losing its initial XRD amorphous character. According to Fig. 5, magnetite existing in the starting geopolymer disappeared and its oxidation products, maghemite (γ-Fe2O3) and hematite (α-Fe2O3) were identified, changing also the colour of the specimen from deep green to yellow and red, gradually. The amorphous aluminosilicate phase has been partially crystallized to Hematite and Maghemite, as is seen in Fig. 5. This proves the excellent thermal behaviour of the GeoAl material during the fire test, since it creates a gradient preventing totally the affect on the concrete. In addition, the surface of GeoAl laid at the interface with concrete, did not appear any macroscopically visible mechanical damage after the end of the fire resistance test. It remained on top of the concrete slab without any change of its geometry, as well as without deep cracks and wide openings. The surface of the GeoAl material exposed to fire remained almost intact, with shallow surface cracks and no other mechanical damages. Concerning the performance testing of GeoVer-40 material against fire,the temperature at the geopolymer/concrete interface was also lower than 180 °C during the whole test duration and more precisely, not higher than 150 °C (Fig. 4). Thus, the 30 mm thick GeoVer-40 coating achieved to maintain the interface temperature at least 25 °C lower than the EFNARC performance requirements for an efficient fire resistant material in a passive fire protection test performed according to the ISO-834 fire curve. As seen in Fig. 4, during the first 20 min, when the furnace temperature was increased rapidly from the ambient temperature to 800 °C, the interface temperature remained at 30 °C, resulting in a temperature gradient equal to 25.7 °C/mm across the fire resistant GeoVer material. Then, the interface temperature started increasing and reached a plateau at 100 °C, at about 55 min after the testing start, lasting at least 20 min. At this time, the furnace temperature was 950 °C, setting thus a temperature gradient across the GeoVer-40 material equal to 28.3 °C/mm. At the end of the test (120 min), the temperature at the interface of concrete and GeoVer-40 reached 150 °C, while the furnace temperature was 1049 °C, establishing a temperature gradient of 30 °C/mm, which is the highest occurred during the entire test duration. The temperature at the unexposed surface of the concrete slab did not exceed 50 °C during the whole test (Fig. 4), thus the temperature across the concrete slab ranged in-between 50 °C and 150 °C, which is substantially lower than the temperature, where spalling of concrete happens. Regarding the external view of the GeoVer-40 material after the end of the test, no any macroscopically visible mechanical damage was observed at the side laid on the concrete slab. The GeoVer coating remained on top of the concrete slab without any geometrical change or surface cracking. Furthermore, the GeoVer surface exposed to fire remained almost intact, without important cracks or other mechanical damages. Athtought the temperature developed at the interface of concrete with geopolymer at the end of each test was low and almost similar, it was 30 °C lower in case of the GeoAl material than the GeoVer. This difference can be attributed to the lower value of thermal conductivity of the GeoAl material, taking into account that for a given heat flux, the lowest the thermal conductivity, the highest the temperature gradient established across the fire resistant material. Given that, at the time of 120 min, the gradient of temperature across the GeoVer was equal to 30 °C/mm and across the GeoAl, 31 °C/mm, this slight increase can justify the temperature difference observed at the interface of concrete with each one of the tested geopolymers. In conclusion, the performance of both geopolymeric materials to the passive fire protection testing, following the ISO-834 fire load curve, was excellent. However, the GeoAl material was proved slightly better than the GeoVer to be used as an efficient heat flux barrier, protecting the buildings structure. This is mainly attributed to the low value of thermal conductivity that GeoAl material presented, which results in a sufficient thermal gradient across the material in case of fire, as well as to the stability of the material’s mineralogical composition. In addition, its macroscopic integrity after the fire test, without showing any mechanical damage or deformation, suggests that there would be no need for serious repairs on the superficial fire resistant material after a fire incident. In terms of mechanical properties, both geopolymers, the GeoAl (produced with the addition of Al powder) and the GeoVer (produced with the addition of vermiculite) were proved comparable with existing cementitious fire proofing materials. Therefore, both geopolymers have the potential to be used as superficial materials for the passive fire protection of buildings. The thermal conductivity of both the Geover and the GeoAl materials was substantially lower from the thermal conductivities of the commonly used structural building materials and marketable fire resistant materials, indicating that the developed geopolymers can perform as thermal insulating superficial materials and used a thermal barrier in front of the fire sensitive concrete lining of building structures. 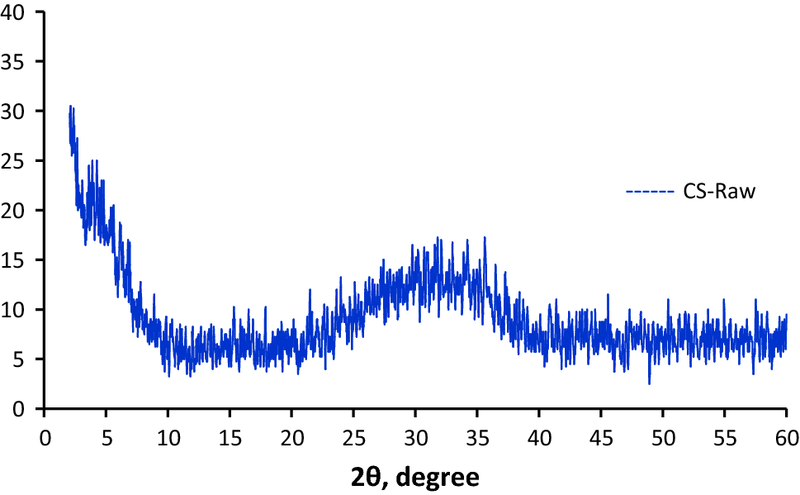 The behavior of both the developed geopolymers during their fire testing under the ISO-834 temperature–time curve was excellent. In both cases, the maximum temperature at the concrete/geopolymer interface was lower than 180 °C, as requires the ISO-386 standard followed. After the fire resistence test, neither the GeoVer nor the GeoAl materials appeared damages or visible deformations. The effectuality of both geopolymers in passive fire protection test proved that they can act as an effective heat flux barrier, offering great passive fire protection to the buildings. In addition, both the developed geopolymers remained on top of the concrete specimen after the end of the fire resistence test, without any macroscopic damage or deformation. Therefore, in case of a fire incident in buildings, the use of these materials is expected to require only minor structural repairs. This research has been financially supported by the EIT Raw Materials Upscaling Project “RECOVER” (Project Agreement No 16365).